I got an email forward today, titled "This is So SAD" or something like that. After I'd scrolled through the list of people who had forwarded it to others, who had forwarded it on and so on, I got to the meat of the message, which started off "Alexandra came out of a rigging fire alive, but now has to fight for her life and a normal future. She is 14 months old and..."
And it went on, describing the anguish of baby Alexandra and her parents. What got me thinking was the last line, which said something like baby Alexandra will get 3 cents for every person to whom the mail is forwarded. How would anyone know I'd forwarded the email? How would they know to whom I'd forwarded it (in order to know to how many). Now, if you think about it, that's a scary thing. In order to know if, and to whom, I'd forwarded the email, they'd need access to my email account. And that's supposed to be private, right? Now I KNOW there's no way third parties can access my emal account to find out if I've forwarded anything but I decided to play safe and check the net to see if I'm wrong. First I found the Trend Micro report that confirmed the email was a hoax. Like I knew, there was no way anyone could know about mail forwards, so there was no question of sending 3 cents to Alexandra's parents if I did forward the email. Then I found something horrific. The story had apparently been taken from the World Healing Network, which asks people to pray for people in need. Whether one believes in the power of prayer or not, here was a true story taken from a genuine site and spun into a MINDLESS email forward. Think of what Alexandra's parents will go through if and when they find out someone is using their personal pain to send a fraudulent email around the world. One might argue that at least this way, more people come to know of the tragedy. However, the email doesn't ask anyone to pray for Alexandra or to send money. It asks them to mindlessly forward the email and Alexandra will receive the money anyway. For most people, this is a convenient balm for the soul. "Hey," one thinks, "I did my part. I forwarded it." But think a little bit more. Every time the email gets forwarded, more email addresses get added into the body of the message. Sooner or later, it will get posted to a public message board, email addresses and all, making each email address available to spammers and pornographers. A baby's tragedy to be used to harvest email addresses? NEVER forward anything without checking. If you don't know how to check, ask me. At the very least, read more on Mind Viruses and Hoax Emails. The Internet Virus Antidote is a good place to start. Turns out 54% of the visitors to DEEPLY SIMPLE are already using Firefox. The balance who are using IE... what can I say? It's up to you. Thank LiveBlogStats from BlogExplosion. Expect a more in-depth analysis of Google Analytics vs LiveBlogStats soon. Here’s a tutorial on partitioning your hard disk and storing your data on partitions other than the C Drive so it remains safe if your Operating System crashes. To understand WHY you must partition your hard disk, read my blog entry on the subject. Partitioning your hard disk can be a tedious process but I strongly recommend it. Once done, your disk remains partitioned (unless you mess with it) and it’s the best means I’ve found of keeping your data safe. Partitioning refers to the sub-division of your hard disk into several “virtual disks”, each of which has its own unique identifying “Drive Letter.” Thus, your computer behaves as if you have several separate hard disks rather than just one. The advantage of this is that if your Windows Operating System crashes due to a virus or physical corruption, your data remains safe and all you need to do is re-format the C partition, reinstall Windows and your other programs and start working again. Your data remains safe. If you’re in a hurry, you may even “boot” your computer from a CD or Floppy Drive and copy your data to a CD / floppy to work on it on another computer. That’s right, pick up the phone and call the nearest geek. Partitioning is an expert operation and involves backing up your data to an external drive, formatting your disk and then creating a partition table. It’s such an expert operation, I’m not even going to tell you how to do it. I don’t want to be responsible, however remotely, for the loss of your data. So call that geek and let him partition the disk. Make sure he backs up your data to an external drive first. Once your hard disk has been partitioned, get your geek friend / professional to save your data into folders on drives other than C.
Let’s say the geek creates two partitions, C and D. Create folders on the D drive to hold your existing data and tell the geek to copy your data into those folders. For example, you may create a new “My Documents” folder with “My Music”, “My Pictures”, etc. as sub-folders, all on your D drive. Then simply copy the data from the external disk into those folders. That’s it. You’re up and running. Here’s where you begin to intelligently use the partition you’ve created… er… the geek has created. Let’s say you create a new Word document. When you try to save it for the first time, Windows automatically takes you to its default document folder, which is C:/Windows/My Documents. Do you see something wrong with the above folder? That’s right, it’s on the C Drive. Exactly where you DON’T want to save it. Then, if the filename is the one you want to give your file, OK your way out or change the filename and OK your way out. Once you’ve saved the file there, Windows will automatically over-write it with new versions of the file every time you save it again. There is, of course, a learning curve associated with saving your file in any but the default folder. You may automatically save a file or two in the default folder, especially if you’re in a hurry. No harm done. As soon as you realise your folly, move the file into the folder in the other partition, using the “My Computer” icon or the ”Windows Explorer” icon. If you need further clarification on the above procedures, just ask. Post a comment here and bung in your question. I’ll answer. Always. 1. Sites like orkut and gmail don't open on mozilla firefox for me, so I still keep IE. How can I get firefox to open them for me? Unfortunately, Yahoo! And MSN are programmed to open websites with IE. You can get around this by starting Firefox first, then clicking the link in your Yahoo! IM or MSN Messenger window. 3. On some pages, it says additional plugins are reqd to display this page, when I click on that, it tells me checking for plugins, but nothing ever happens. Don’t navigate away from the page after clicking the button. It takes a few seconds, then you should see the “Checking for plug-ins” window. If it still doesn’t download the plug-in, check if there’s another plug-in button on the webpage you’re trying to read (not the bar that Firefox opens). You may have to download and install the plug-in manually. I'll never be tired of telling people, "Partition your hard disk!" Let's face it, most of us don't back up our data. Even I don't and I'm more computer-savvy than most. Yet, should my computer crash - which happens more often than I'd like - my data is always safe. That's because I CREATE my data on partitions other than the C Drive. I never use the default Windows folders to save my files. My Hard Disk has been partitioned into four different drives, C through F. The C Drive is for software. The D Drive is for my text data and images. E is for stuff I download from the Internet and F is for my music files. I never use the default folders to save all this data. I always navigate to the folder I want to use - which is never on the C Drive - and save the file there. The advantage is that, should the Operating System fail, all I have to do is reinstall it and the other software and I still have access to my data. Once you get used to saving data in the folder you want and not the default folder, everything becomes easy. And, while I'd never tell you not to back up your data, it'll still be safer than if you'd saved everything on the C Drive. Okay, if you still aren't convinced about Mozilla Firefox, here's one more reason to switch: Live Bookmarks. Live Bookmarks is Firefox's way of making RSS so darned easy to use, you'll wonder why you never used it before. I won't launch into what RSS stands for and all the good things it does, but I'll tell you this: RSS is a way for you to get automatic updates on sites that are RSS-enabled. Like to check out the latest news? Got a friend whose blog you check regularly? Well, if the sites are RSS-enabled, Firefox lets you add a special bookmark that tells you, at a glance, if new content has been added. What has happened here is that Firefox has picked up Tom's latest post (the topmost one in the right-hand panel) and I know immediately that Tom has a new post. That means, on days when Tom doesn't post, I don't waste time going over to his blog to see if he's posted something new. if the site you're visiting is RSS-enabled. Then, just click the icon, follow instructions and a Live Bookmark will be added to your list of bookmarks. 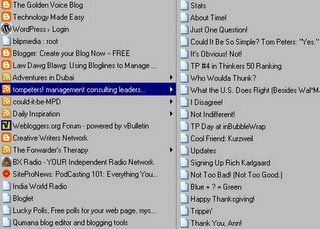 Once you add the Live Bookmark, you need only move your mouse pointer to it (after clicking the Bookmarks menu item) to see the list of posts. If there's a new post, or a post you want to revisit, simply move your mouse pointer to it. The post will be highlighted and clicking it then takes you directly to the post. Cool, huh? Firefox also comes with a live bookmark pre-installed: "Latest Headlines"
You'll see this next to the "Getting Started" bookmark just below the buttons in Firefox. It's the RSS feed from BBC. If you want to check out the latest news, just click the button and select the headline from the list that appears. Here's a little note to tell you why you should switch over to Mozilla Firefox. Note: I'm still trying to figure out how to have my blog template underline links. Till I do that, just mouse-over (move the mouse pointer over) bold, yellow entries and you'll see that they are links. It happened again. A friend sent me a panic email saying Internet Explorer wasn't working properly. Like most "help!" emails I get, the problem wasn't very clearly explained, but I gathered that Internet Explorer did nothing when links were clicked and was shutting down on its own at various points. I asked her to run AdAware to check for spyware. She found over 800 of the blighters (I'll explain in a new post soon what spyware is and what AdAware does). Internet Explorer, however still wasn't working. Then I did what I should have in the first place; asked her to go download Mozilla Firefox, install it and use it instead of IE. She was up and running in literally minutes. I've been using Firefox for a long time now, so long that I can't even recall a time when I was using IE. Despite its occasional crashes - which are because of my Operating System, I think - it's just one of the BEST browsers out there. On every occasion that it has crashed, I've simply reinstalled it and I'm up and running again. Of course, I also regularly export my bookmarks to a file so I can import them into Firefox if it, or the Operating System, crashes. Incidentally, my Operating System crashes far more often than Firefox does. Firefox just doesn't allow the baddies to install adware, spyware and malware on your computer. These are programs that some sites install - unbeknownst to you - on your computer to track your surfing habits or even to trap your username and password. The occasional fellas do get through, but AdAware takes care of them. I won't go into the details of the how and why of it here but EVERY user who switches from IE to Firefox is instantly thrilled at the speed with which it loads pages. Once you get used to that speed and you have to use IE for some reason - at a net café, say - you'll chafe at the loooooong wait while pages load in IE. When you install Firefox, it automatically imports your surfing history and favorites (Firefox calls them "bookmarks") from IE. You don't have to do a thing, apart from download Firefox, install it and start using it. Firefox automatically blocks those annoying pop-ups that some sites have. It also tells you that it has blocked a pop-up and gives you the option to allow pop-ups from that site, so you can still comment on blogs that have set comments to open in a pop-up window. From my experience, it's very good at telling a "good" pop-up from a "bad" one, so it might not even block pop-ups from legitimate sites. Over the next few days I'll be telling you more about Firefox and its really cool features. For now, head over to Mozilla.com and download Firefox. You'll wonder how you ever did without it.